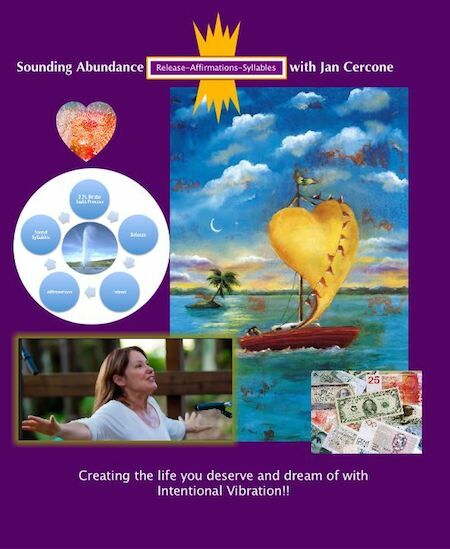 The Sound of Abundance matches the Tone in your Voice! You are just thinking about sitting down and making the “List”…you know, the list of the golden bank account goals for the New Year. You might even specify an amount and see the checks being written out to you as some visualization gurus instruct you to do. But the murky underpinnings of change will override your best intentions. Why? Thinking the same thoughts and setting the same intentions will not make you richer or prosper anymore in 2016 than 2015. Simply because we are creatures of habit and make our decisions based on our “inner” landscape of feelings and most of what we do is below our conscious level Our underlying intentions are not really clear to us so we can’t create powerfully in a new direction! And most of our choices around money are rooted in fear due to our parent’s messages of lack and scarcity. So, until we approach it VIBRATIONALLY….as an attraction vibrational field issue we will have the same thing over and over again. My computerized Voice Bio program can pinpoint the harmonics of your voice that tell the world your inner story of not good enough, don’t expect to get money or your fears and resistance around money. If we worry about money we have a high F sharp and everyone “feels” it around you. Your Voice is your calling card to the world and until you change the harmonics you will not attract or manifest. How do we override our innate harmonics determined by the powerful primal need to be consistent and safe with our pattern of limiting thoughts? We need to hit the actual Vibrational root of the thought that supports the beliefs that activates the behavior. We can Sonically re-pattern our natural GPS system towards a new goal. It’s not easy at first because we must stop the thinking and go into the still place of nothing as the Buddha suggests. THEN and only then with the slate clear can we use our own Voice, our own sonic amplifier to engage our entire body, heart and soul in the process. We can Release and Re-set if we have a “process” to lay down new tracks!! Press this Purple bar LINK below to order your own How to Cd! It takes just 21 days to stabilize a change within you. Try this for 10 minutes for 21 days and watch what happens. You just might, or I can say with certainty, you WILL strike gold.